The documentation for this toy being used during the civil war is from a secondary source which mentioned they had been know in the United States from the early part of the 19th century. Reinforcing the potential existence of the toy was a post-war reference in the book On the Banks of Plum Creek by Laura Ingalls Wilder. Laura describes a party at the house of -- who else for those who remember the television series -- Nellie Oleson. While at the party they played with what they called a jumping jack and Laura recounts, "Even the big girls . . . laughed at the jumping-jack till they cried." To play with the toy, it is held vertically (not horizontally as shown) with the figure of the man at the top. One hand is used to hold both vertical sticks below the cross-bar at the same time. 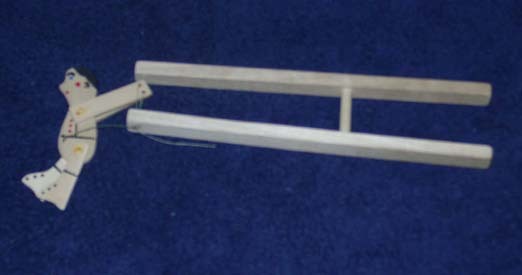 To make the man do acrobatics, the vertical sticks are gently squeezed together which tightens the strings at the top. This tightening causes the man to flip up. If the hand is then relaxed, the man will flop down and be ready to go again.